In last month's whitepaper examining how time spent in the market means more to stock-market investors than market timing ("Time, Not Timing, Is What Matters"), we concluded by saying we would examine investor returns vs. investment returns in this month's white paper. So here we are. Think about this: How can a mutual fund have, say, a 9% return over a 10-year period, even though the average investment in it realized less than 3% return? Unfortunately, it's because investors acting on their own have an uncanny ability to buy high and sell low on a consistent basis. Picture yourself in outer space, gazing down on Planet Earth: You see a perfectly round, smooth orb, truly a thing of magical beauty. Closer up, you notice mountains rising high and valleys digging deep. Looking at a map and navigating the actual terrain it depicts are very different experiences indeed. Similarly, scanning a long-term investment's development and looking at where it's going doesn't tell us much about the process of achieving its end, for "statistics provided rather bloodless answers," in Adam Smith's words. For instance, the following chart depicts the 7.3% compounded annual growth rate of S&P 500 companies from 1997 to 2016. Easy ride, no? Think again. Transforming $1,000 in 1997 into a 313% return of $4,128 by year-end 2016 was nothing short of a tough haul. The next chart clearly differentiates the flat map from the rugged terrain, and the white space inbetween the fluid red curve and the scraggly black line signifies the occurrence of unforced investment errors, especially where investors acting on their own threw in the towel at lows. The chart below graphs S&P 500 performance against the distance it dropped from its highs over its course, thus indicating the investment terrain's true up-and-down ruggedness. 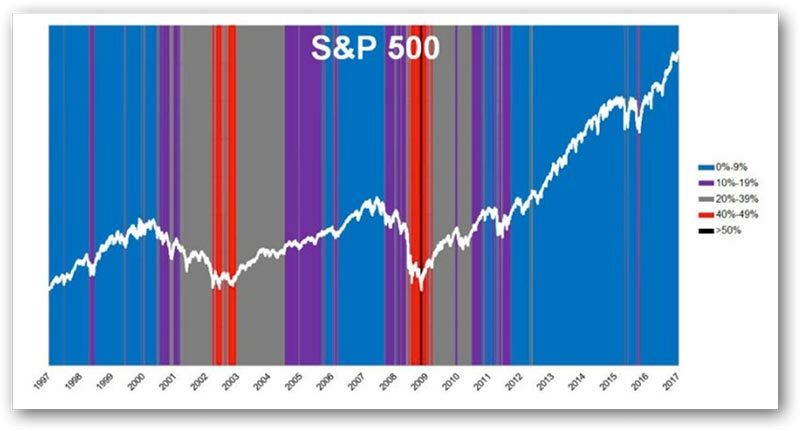 The chart below shows us that, while the deepest valleys have the shortest duration, that's more likely when most investors acting on their quit the game, and that an investor could be below the most recently set high over 50% of the time. The index was 20% or more distant from its highs 27% of the time. Staying committed to your plan sounds easy, but the drawdowns make commitment extremely difficult without a long-term investment plan, since many investors believe that zero is always in play. 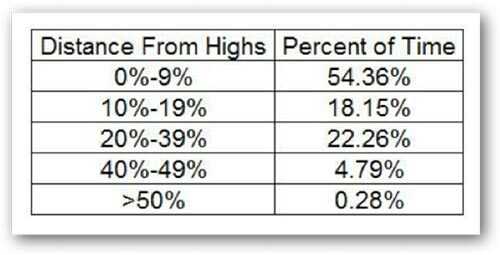 The ‘catastrophe scenario' investors often dwell on took place only 5% of the time, if you look at 40% and higher downward moves, and 27% of the time if you look at any downward move of 20% or more. Don't get us wrong—a 20% decline is no sunny day in paradise. Yet even disciplined, long-term investors will see several such declines in the lifetimes of their investments. Gyrations in Berkshire's earnings don't bother us in the least: Charlie (Munger) and I would much rather earn a lumpy 15% over time than a smooth 12%. (After all, our earnings swing wildly on a daily and weekly basis – why should we demand that smoothness accompany each orbit that the earth makes of the sun?) We are most comfortable with that thinking, however, when we have shareholder/partners who can also accept volatility, and that's why we regularly repeat our cautions. 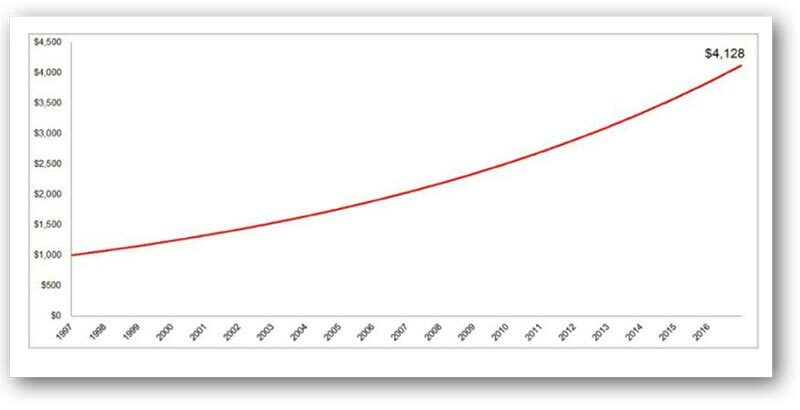 Berkshire Hathaway earned 9,918% (29% per year) from 1982 to 2000, over a very rough terrain, yielding a standard return deviation of 11.5% for the Dow and 33.6% for Berkshire over those 18 years. Most investors do not earn returns of that magnitude because they are overconfident in the beginning and narrowly focused on the final outcome, hence caught off-guard when the terrain becomes rockier. Buffett once said, "I never attempt to make money on the stock market. I buy on the assumption that they could close the market the next day and not reopen it for five years," which is unusual for one of the 20th century's greatest investors to say. Yet it tells us plenty about what has made him so great: his habit of investing for the long term and not worrying about the short-term value of his investments. That is, sound investor behavior is the main prerequisite for investment success. A recent study by the Bogle Investment Center at Vanguard Investments found that the average equity mutual fund in the U.S. produced an average annual return, with dividends reinvested, of 9.6% from 2004 to 2014. 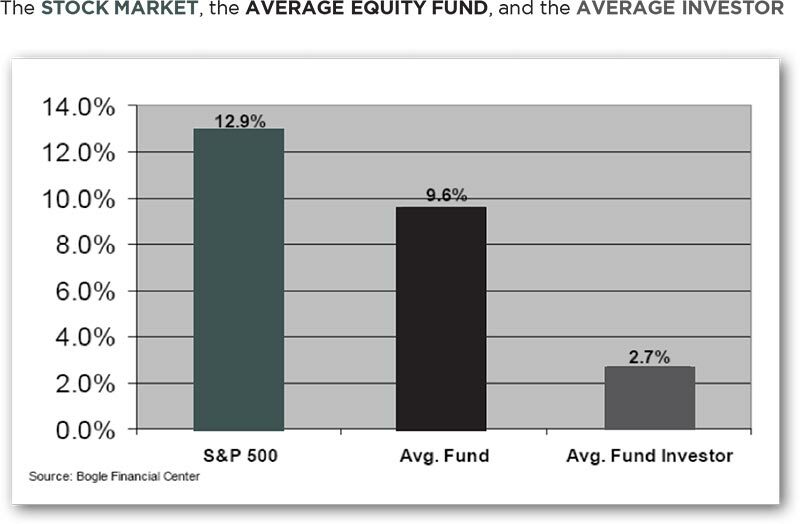 During that period the average equity investor earned 2.7% in equity mutual funds. Clearly the performance of specific mutual funds cannot account for the difference. Investor behavior (moving and switching) is the only logical explanation for the average investor's lower return. The point is: Behavior, which is driven by one's beliefs or perspective, is the primary driver of investor performance, good or bad. As Buffett said, "Success in investing doesn't correlate with IQ once you're above the level of 25. Once you have ordinary intelligence, what you need is the temperament to control the urges that get other people into trouble [quitting, or selling, at the lows] in investing." As your advisor, we at WT Wealth Management provide the efficient, cost-effective after-tax results needed to help your investment performance meet the expectations of your financial plan. We not only manage your investment's design and structure; we also have the necessary discipline to increase your probability of success. Mistake #1: People too often use their recent investment experiences to predict what will happen to their investments in the future. This is often called the "this time is different" syndrome, and the '90s investment bubble exemplified this. Mistake #2: People who frequently measure their investments shift them often, which greatly undercuts their investment performances. Given the inevitable unevenness of market returns over time, proper measuring methods are needed for long-term investment success. Solution: Look at your investment results quarterly, not weekly or monthly. Mistake #3: People don't give the markets a fair chance to yield them the benefits those markets could hold for them in the long term. 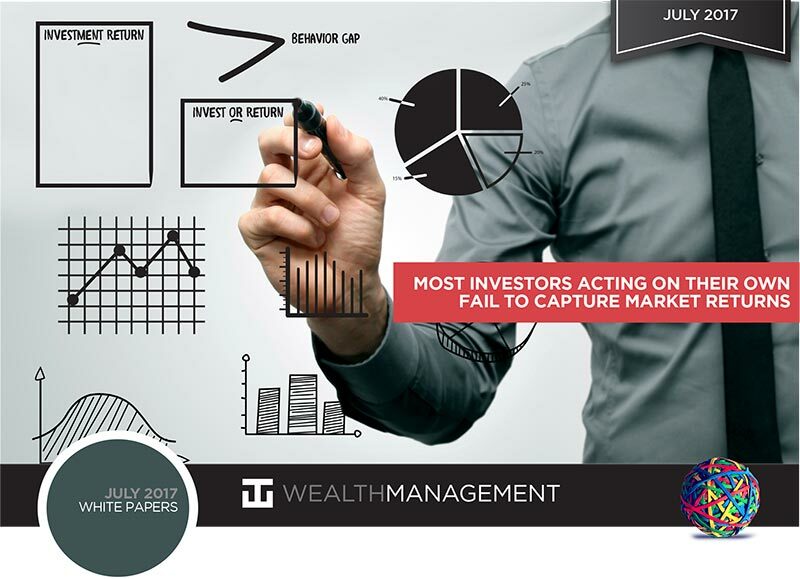 Solution: Time in the market, not timing the market, is key to successful investing, as we explored in last month's whitepaper. Mistake #4: People shun actions that affirm their errors, even if those are the wisest actions, and cling to those errors too long in order to shirk proper acknowledgment of them. Solution: Sell losers quickly and move on. Are we always right? Heck, no. Do we make money for our clients over a full market cycle? Heck, yes. How do we achieve these results? Just go back and read our past two months' white papers. As a firm, WT Wealth Management has rigid beliefs in our approach to investing and a flexible style in order to find value and momentum in virtually any market. We take the time to educate our clients so they understand that they are in it for the long haul. We let them know the terrain will be bumpy, but we urge them to keep their eyes on the horizon. The combined hours our WT Wealth Management team spend on market research each week greatly surpasses 100. We are no different than any other professionals, be they dentists, doctors, lawyers or engineers. This is our life, we live and breathe it, we eat it sleep it, and most importantly, we have our money in our own strategies. We eat our own cooking, and we think that's incredibly important. The greatest compliment you can give us is to refer us to a friend, family member or acquaintance who is struggling to find a good way through the difficult investment terrain. I referred to this last month. I have met people that have been out of the market since 2009 simply because of fear, and then, after the markets recovered, they felt as if they had missed the move. Heck, people felt that way a year ago, and we have had one of the great runs in the history of investing over the past six months. Will it continue? I doubt it. 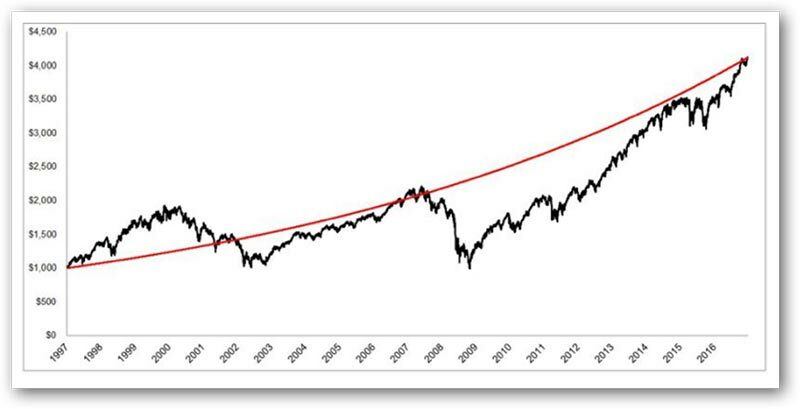 But the next great selloff is the next great opportunity to be part of something great. Every day is a great day to invest, in our opinion. However, you need a plan, a strategy, and commitment to the process to fully realize the potential of the equity markets. Batnick, M. (2017, May 11). The map versus the terrain. The Irrelevant Investor. Buffett, W. (1997, February 28). "Berkshire Hathaway Inc.: Chairman's letter." Berkshirehathaway.com. Padrón, R. V. (2005, February 27). Investor returns vs. investment returns. Brightworth. Quinn, M. (2015, March 8). Warren Buffett's most misunderstood investment advice. GO Banking Rates. Smith, A. (2006). Supermoney. Malden, MA: John Wiley & Sons Inc.
WT Wealth Management is a registered investment adviser in Arizona, California, Nevada, New York and Washington with offices in Scottsdale, AZ Jackson, WY and Las Vegas, NV. WT Wealth Management may only transact business in those states in which it is registered, or qualifies for an exemption or exclusion from registration requirements. Individualized responses to persons that involve either the effecting of transaction in securities, or the rendering of personalized investment advice for compensation, will not be made without registration or exemption. WT Wealth Managements website is limited to the dissemination of general information pertaining to its advisory services, together with access to additional investment-related information, publications, and links. Accordingly, the publication of WT Wealth Management web site on the Internet should not be construed by any consumer and/or prospective client as WT Wealth Management solicitation to effect, or attempt to effect transactions in securities, or the rendering of personalized investment advice for compensation, over the Internet. Any subsequent, direct communication by WT Wealth Management with a prospective client shall be conducted by a representative that is either registered or qualifies for an exemption or exclusion from registration in the state where the prospective client resides. For information pertaining to the registration status of WT Wealth Management, please contact the state securities regulators for those states in which WT Wealth Management maintains a registration filing. A copy of WT Wealth Management's current written disclosure statement discussing WT Wealth Management's business operations, services, and fees is available at the SEC's investment adviser public information website – www.adviserinfo.sec.gov or from WT Wealth Management upon written request. WT Wealth Management does not make any representations or warranties as to the accuracy, timeliness, suitability, completeness, or relevance of any information prepared by any unaffiliated third party, whether linked to WT Wealth Management's web site or incorporated herein, and takes no responsibility therefor. All such information is provided solely for convenience purposes only and all users thereof should be guided accordingly.